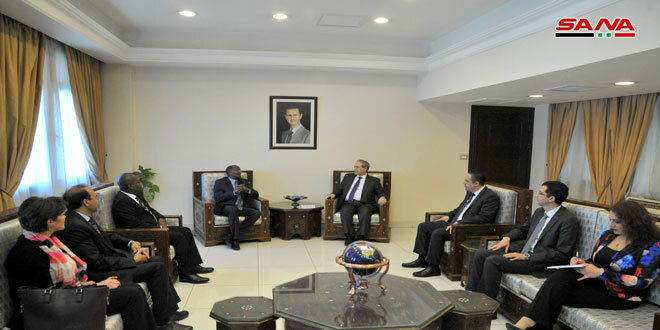 Damascus, SANA – Deputy Foreign and Expatriates Minister Fayssal Mikdad on Monday met Michael Ebye-Amanya, the new Director of the UN Relief and Works Agency for Palestine Refugees (UNRWA) office in Syria, and Mohammed Abdi Adar, the current director who will leave his post in February. 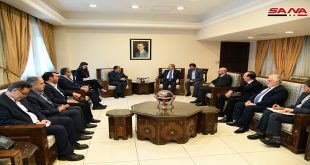 Mikdad welcomed the new director, asserting that Syria will continue supporting UNRWA to ensure providing a good life to Palestinian refugees in the country and enhance copreation between the two sides. The Deputy Minister said Syria supports the UNRWA in the face of the challenges it faces and the attempts by the US and the Israeli occupation authorities to undermine the organization. He denounced the Israeli decision to shut down UNRWA schools in Al-Quds (Jerusalem). For his part, Ebye-Amanya voiced gratitude for Syria’s efforts to ensure the success of the UNRWA, thanking the government for the facilitations provided to his predecessors which he witnessed firsthand when he was Deputy Director. Mikdad also voiced appreciation of Adar’s efforts during the time he was director, while Adar noted that Syria is one of the few countries hosting Palestinian refugees that treats them like citizens.